Remembering and honoring loved ones is an Easter tradition at ECOT. 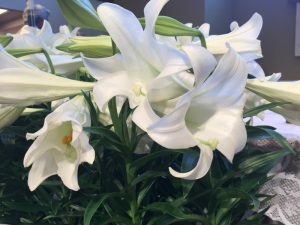 Beautiful lilies will adorn the alters at both the Vail and Edwards interfaith chapels on Easter Sunday. Please consider purchasing Easter Lilies to honor and remember loved ones – complete the form and send in with your payment to our offices. Lilies may be taken home at the conclusion of each service. The proceeds supports Transfiguration’s Mission Work.